Birthday weekend kicked off a day early this year. 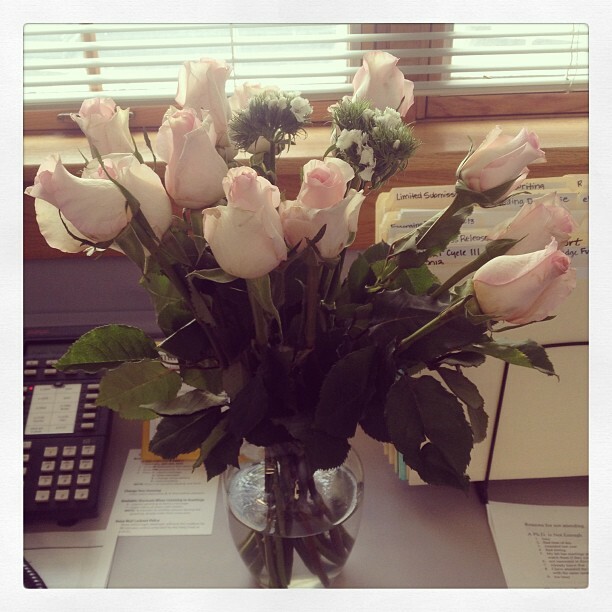 Tim surprised me by sending flowers to my office last Wednesday. I took a half day at work on Thursday and he didn't want them to miss me, so he sent them a day early. I was totally surprised. Boys: there's nothing that will put a smile on a girl's face like sending her a bouquet of roses. On my actual birthday, I left work early and treated myself to a facial and massage (if you live in the Portland area, the ladies at Zara Clinic are beyond amazing). From there, I stopped by my parent's house to pick up a few more b-day goodies, and then Tim took me to dinner at a nice steak house downtown. With all the weddings and events going on this summer, I opted to keep things relatively low key this year, but I felt very loved and spoiled, which is all a girl can ask for, right? Debbie, me, and my mom at dinner. On Friday, I met up with my girlfriends and we did a three-course "fondue experience" dinner. I eat cheese fondue all the time, but I've never done one of those entrees where they give you raw meat and you cook it on your table. It was a riot. I'm surprised none of us got food poisoning from eating undercooked chicken. 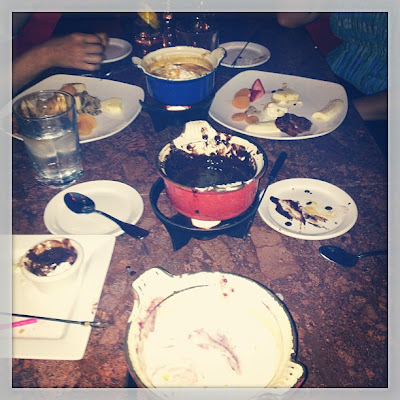 Caramel, chocolate, and cheesecake-flavored fondue. Aside from submitting a comment to the FDA last week in support of reclassifying tanning beds, I've been relatively inactive in the melanoma/skin cancer arena lately. At points last spring, it became all consuming--testifying down in Salem and planning the Portland Melanoma Walk. As with anything, I think we all just sometimes need a break from things. I just need to allow myself to fully relax and not carry the burden of needing to be doing something all the time. Something to work on for "27" perhaps? Looks like a GREAT birthday! Pretty flowers. 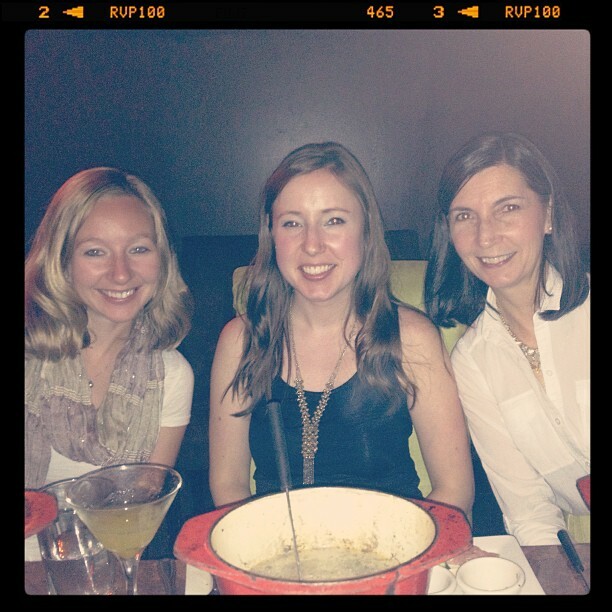 I need to try fondue at a restaurant. Birthdays are special almost for everyone. Birthday is a day for celebration and enjoyment. You have celebrated a wonderful birthday. Tim has made a nice surprise and yes a bouquet of flowers especially rose is one of the gifts that can bring smile on a girl’s face. Every woman like flowers and rose is a flower that symbolizes love. It is good that you got the flowers a day before the birthday, so you get prepared for the birthday. There are many colours of roses such as yellow, red, pink, white and many more, each having some meaning associated with the colour.